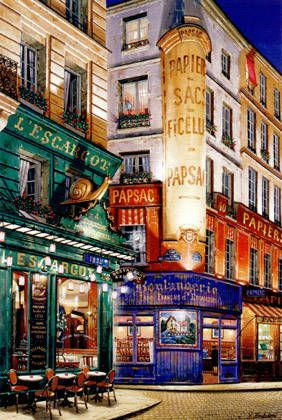 Home | Serigraphs and Giclee Fine Art | Liudmila Kondakova Parisian Art | Liudmila Kondakova Signed And Numbered Limited Edition Serigraph:"L'Escargo "
Liudmila Kondakova Signed And Numbered Limited Edition Serigraph:"L'Escargo "
Image size:24 " x 36 "
About the Print: "L'Escargot" truly reveals a more subtle, muted side of the artist's marvelous color sence and artistically communicates her dedication to her training as a skilled painter. Of her training, she said, "We worked with the most beautiful colors. Monks prepared them for us, taking hours to grind them into powder ... Then, they shared the secrets of the solemn beauty of icon painting with us, a beauty that lies in the love that goes into each detail, no matter how small or insignificant. In my art, the essence and beauty has always rested in the details." Liudmila Kondakova continues to carry on the traditions of her training by using pure, strong and vibrant pigments. The emerald green, garnet, azure, and amethyst hues capture the jewel tones of the exquisitely lit intimate corner of the Parisian street scene featured in "L'Escargot." As well, details are abundant in "L'Escargot." The decorative snail adornment above the restaurant takes precedence. The worn antiquated wood panels of the boulangerie are embellished with a mosaic-style mural which in it self is a stunning work of art. The royal blue street signs are true to life signage in Paris, and again divulge the artists ever present attentiveness to detail. "L'Escargot" is a typically wonderful French restaurant where one can settle in with a delectable dish of butter-laden escargot, a glass of wine and a fresh baguette from the boulangerie across the street. So traditional for the traveler as well as the true Parisian. The delicately curtained windows of the apartments above the cobblestone street level are exposed just enough to intrigue the viewer's imagination. With "L'Escargot" one can drift easily into a Parisian fantasy. The beauty, no doubt, lies in the exquisite details of this remarkable work. Home | Fine Art Prints & Limited Editions | Gallery Direct Art is your Authorized Chalk & Vermilion Dealer | Liudmila Kondakova Parisian Art | Liudmila Kondakova Signed And Numbered Limited Edition Serigraph:"L'Escargo "